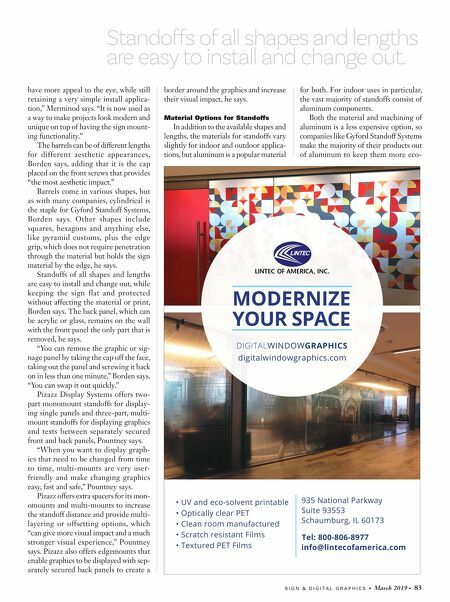 S I G N & D I G I T A L G R A P H I C S • March 2019 • 83 have more appeal to the eye, while still retaining a very simple install applica- tion," Merminod says. "It is now used as a way to make projects look modern and unique on top of having the sign mount- ing functionality." The barrels can be of different lengths for different aesthetic appearances, Borden says, adding that it is the cap placed on the front screws that provides "the most aesthetic impact." Barrels come in various shapes, but as with many companies, cylindrical is the staple for Gyford Standoff Systems, Borden says. Other shapes include squares, hexagons and anything else, like pyramid customs, plus the edge grip, which does not require penetration through the material but holds the sign material by the edge, he says. Standoffs of all shapes and lengths are easy to install and change out, while keeping the sign flat and protected without affecting the material or print, Borden says. The back panel, which can be acrylic or glass, remains on the wall with the front panel the only part that is removed, he says. "You can remove the graphic or sig- nage panel by taking the cap off the face, taking out the panel and screwing it back on in less than one minute," Borden says. "You can swap it out quickly." Pizazz Display Systems offers two- part monomount standoffs for display- ing single panels and three-part, multi- mount standoffs for displaying graphics and texts between separately secured front and back panels, Pountney says. "When you want to display graph- ics that need to be changed from time to time, multi-mounts are very user- friendly and make changing graphics easy, fast and safe," Pountney says. Pizazz offers extra spacers for its mon- omounts and multi-mounts to increase the standoff distance and provide multi- layering or offsetting options, which "can give more visual impact and a much stronger visual experience," Pountney says. 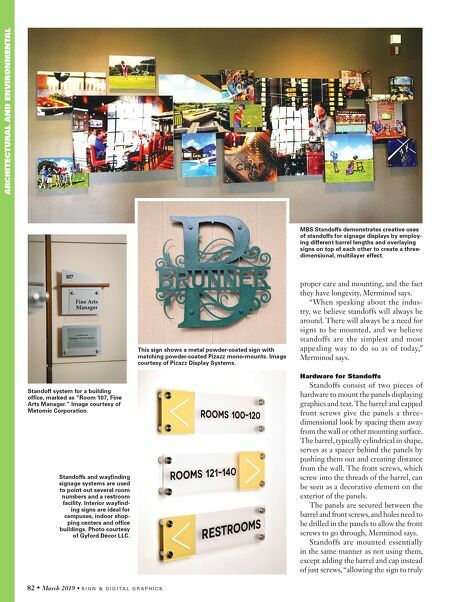 Pizazz also offers edgemounts that enable graphics to be displayed with sep- arately secured back panels to create a border around the graphics and increase their visual impact, he says. Material Options for Standoffs In addition to the available shapes and lengths, the materials for standoffs vary slightly for indoor and outdoor applica- tions, but aluminum is a popular material for both. For indoor uses in particular, the vast majority of standoffs consist of aluminum components. Both the material and machining of aluminum is a less expensive option, so companies like Gyford Standoff Systems make the majority of their products out of aluminum to keep them more eco- Standoffs of all shapes and lengths are easy to install and change out.